Update 1.6 was the long awaited PvP patch, including a new warzone, Ancient Hypergate! Now that it has officially launched, here is a complete guide with some new, clever strategies at the end. You will notice it is probably the most beautiful PvP map in the game if you have time to enjoy the scenery, which fortunately, you don’t! This is a dynamic and enjoyable warzone, with lots of movement and lots of killing. Here is the map of Ancient Hypergate with some notes. D and E: These are the “accumulated energy potentials.” These are the scores for the round including the permanent scores from previous rounds. F and G: These are the permanent scores. The accumulated energy potentials become the permanent scores after the pylons explode in each round (it is possible to lose accumulated energy potential, but not permanent score). Note that this number includes previous rounds and any Gree energy orb points. H: This is a multiplier which starts at 3x and increases by one every round. This multiplier affects how many points you will get for each kill and Gree energy orb (see below). Ancient Hypergate consists of rounds that cycle among capturing pylons, killing players and gathering Gree energy orbs, and running for safety at the end of the round to avoid dying in the shockwaves produced by the pylons. Capturing the pylons works just like it does in Alderaan Civil War. It is pointless to attempt to capture a pylon that someone else is already capturing. You can be interrupted just like in ACW and will have to start completely over. It is a 6-second cast time. The first way to score is by capturing a pylon. It seems there are different rules governing how many points you will get based on whether or not your team already owns a pylon. If you capture a pylon when you don’t have one already, it awards some number of points, depending on round (the reports of others and my observations seem to be inconclusive on how many). Double-capping (getting both pylons) doubles your score for that round. Double-capping also completely erases the other teams score for that round, but leaves their permanent score intact (i.e. resets their accumulated energy potential to their permanent score). The primary way to score is by running to the middle, picking up a Gree energy orb, and bringing it back to a friendly pylon. Picking these up gives you 1000 attacker points, and killing an enemy orb carrier gives you 500 defender points. 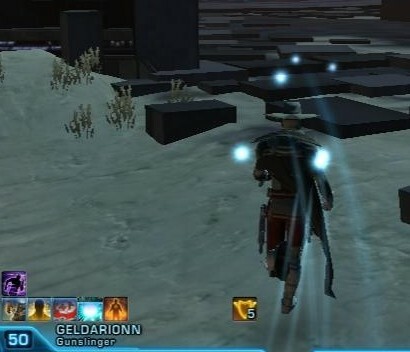 There are only four Gree energy containers in the middle, and they have a respawn timer, based on when the previous orb carrier died or deposited their orb. Once you have the orb (which comes in the form of a buff), you run back to the pylon to deposit it. You only need to get back to the area of the pylon and the buff will disappear. Once you deposit the orb, it gives a straight number of points which is twice the current multiplier. These points are added to the permanent score (i.e. you cannot lose them in the case of a double-cap). Another way to score is by killing other players. Kills grant points to your score, depending on what the multiplier is and how many pylons you have. For example, in the first round, the multiplier is 3x, so you will gain 3 points for a kill if you have one pylon and 6 points per kill if you have both pylons. There is a 2.5 minute timer that ticks down as you are capturing pylons and gaining points. When this timer finishes ticking down, the pylons will charge up and the energy will disperse in a giant shockwave that kills anyone outside. The only safe places are the spawn points, the areas under the spawn points, and the middle area. Needless to say, CC-breakers will be very important in this part of the game. While the pylons are charging (little circles turning the team color), the pylon cannot be flipped, but kills during this time do count towards the score. Once the shockwave explodes, the accumulated energy potential will turn into the permanent score. If either team’s permanent score is higher than or equal to 600 points, the game is over. Note that you can get over 600 points of accumulated energy potential before the shockwave starts but you will still have to finish out the round to make it into the permanent score. This can result in games that end up scoring higher than 600 (I saw one that went up to 888). 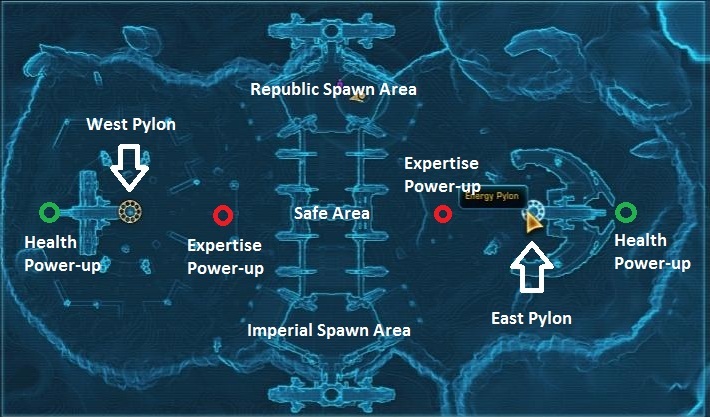 The areas under the spawn points have speed powerups that can allow you to reach the pylons at about the same time someone would from the middle area. The benefit of this is that you will be at full health from waiting alone under the spawn, where they were probably fighting for their lives against your teammates. Some guards are dumb enough to leave the pylon they are guarding upwards of 10 seconds left, trying to avoid the shockwave. A good stealth player could sneak to the enemy pylon, wait until about 8 seconds left, flip the pylon to double-cap, effectively making it so they cannot get it back in time for the shockwave. This strategy, late in the game, can make for an awesome comeback. Cycle through guards as you are protecting the pylon. As soon as you see someone pass around the ledge in front of you carrying an orb, start heading to middle. If you time this properly, you will get to middle at the same time they deposit their orb, allowing you to pick it up and start heading back. This also makes sure the pylon always has a guard. Most games are won not by the player kills you get, but by the Gree energy orbs. Get that cycle going! I’m New, What Do I Do? Head to the middle of the map and pick up the cubes that are glowing. Hit other players if they are trying to pick them up to keep them from doing so. Once you pick one up, head to your pylon (look at your map, it will be green). Don’t leave a pylon alone. If you see you are the only one there, stand there guarding and say something in chat if you see enemies coming. Watch the timer in the top of the scoreboard. When it hits 30 seconds, start heading back to the middle again, unless you are guarding the pylon for some reason. In that case, just stay there until 8 seconds and if you don’t see any enemies, start heading back to middle. Check behind you as you run to make sure there wasn’t a stealth player.